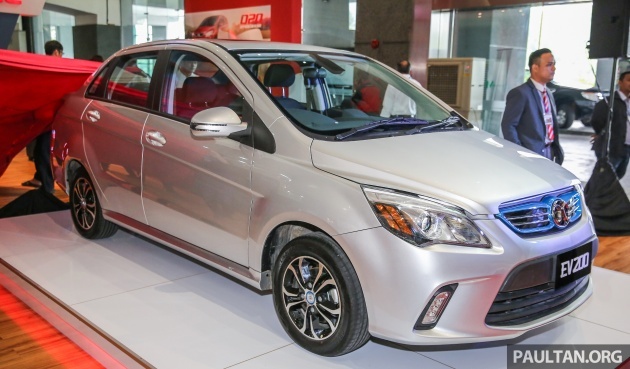 Beijing Auto International Corporation or BAIC (pronounced as baik) has officially introduced Malaysia’s first locally-assembled electric vehicle (EV) – the EV200. To be built either in Gurun or Pekan, as part of a joint venture between BAIC and local partner Amber Dual, the EV200 is said to be built on the previous-gen Smart ForFour’s platform, with styling derived from the first-gen Mercedes-Benz B-Class. The Malaysian-market models represent the first right-hand drive units for the Chinese brand. The EV is powered by an electric motor rated at 40 hp and 102 Nm which drives the front wheels, paired with a 30.4 kWh lithium-ion battery pack. In terms of performance, the EV200 will make the 0-100 km/h sprint in 13 seconds and will hit a top speed of 125 km/h. Said batteries also provide a claimed driving range of up to 200 km following the NEDC cycle, and they are produced by a joint venture between BAIC and South Korea’s SK Group. For Malaysia, three variants of the EV200 will be offered – Relaxing Version, Showy Version and Enjoyable Version, the latter being the range-topper. Six exterior colours are available as well – Madrid red, Alpine white, Milan silver, Hamburg grey, Deep blue and Champs elysees gold. Standard exterior equipment found on all variants include 14-inch alloy wheels, projector headlamps, and rear combination taillights. Aside from the Relaxing Version, all variants come with UV-resistant glass, electric side mirrors, parking sensors and a rearview camera. As for the cabin, the kit list is largely shared across the range, with items such as a 6.2-inch LED multi-info display, fabric seats, three-spoke steering wheel and automatic air-conditioning being present. All cars also come with a double-DIN infotainment unit linked to an 8-inch colour display. The entry-level variant’s unit features MP5 playback and navigation function, whereas the remaining variants tag on additional features corresponding to the car’s electric powertrain systems. The accompanying mobile app also comes with a remote control function on top of remote data query for all variants save for the Relaxing Version as well. Moreover, they come with a six-speaker sound system compared to the four-speaker setup on the base variant. In terms of safety, the EV200 comes with dual front airbags (driver and front passenger), anti-lock braking system and electronic brake force distribution. 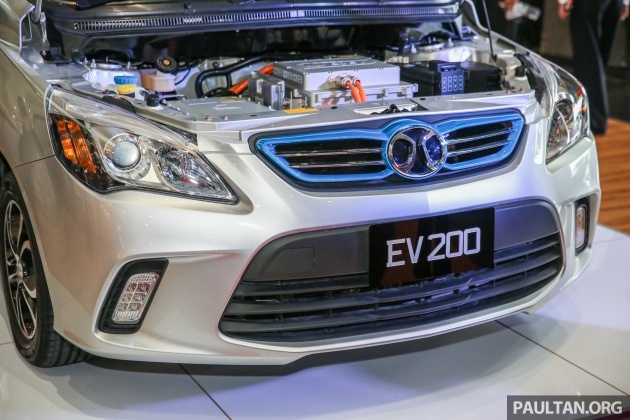 The company did not reveal the pricing for the EV200 during the model’s debut here at the Mines International Exhibition & Convention Centre (MIECC) as the company will only begin sales next year, by which time they will be announced. does it have a level 2 / dc charging capabilities?? yes. it supports the dc charger. Where is the god da*n Proton EV/hybrid? As usual, too much talk and saliva nothing achieved but only higher and higher amount of money begging from the government! This is so shameful. By right, Proton or Perodua, our national car makers should be the first to introduce the first locally assembled EV car. The big question is where is our Proton Iriz EV? Proton showcased it 3 years ago. 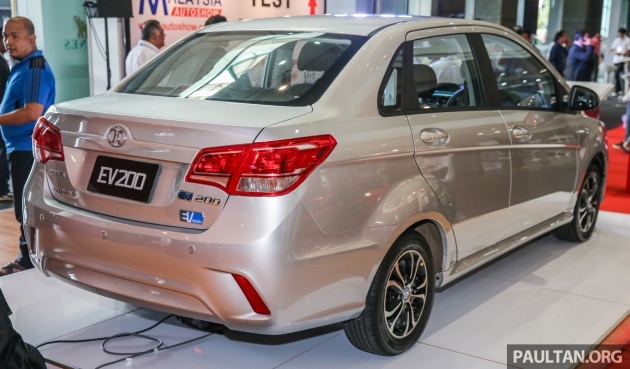 Proton made so much of noise about the Proton Iriz EV. Infact, Proton told the Government they needed more FREE money to do somemore research on the Proton Iriz EV. So, government gave them few hundred million again 3 years now, no news about the Proton Iriz EV. We Malaysians want to support our local products. Though BAIC is joint venture, whatever profits is expatriated back to China. If we buy our local Proton Iriz EV, at least all money goes back to Proton and circulates in Malaysia. This is why Proton CANNOT sell EV here in Malaysia. To make way for CHINA to sell their car here. PROTON & P2 still CANNOT sell their car there. Worry about the water in your country instead of coming here to create anger.Dont pretend to be malaysian lah bang. Baic close shop than losing money,my advice to both..consumers and company.Who’s gonna buy this? Baic cancel your plan to market this not Baic at all!! Wow… China beat us in our own lands to pasang the first malaysian assembled EV. Aiyoh… malulah. Faster Proton, just grab the internals and put it into the Iriz and claim as 2nd Malaysia assembled EV. Or Perodua wanna claim that place? Obvious red flag to stay away. Thats due to direct translation from chinese language…but who cares! Nice EV for our weak super duper weak ringgit to deliver the idea of ev to low income group in the country who still care about air pollution in the city we live in cheers end yo. Baik punya kereta! Can get EV Merc at cheapo price. I am not against the EV development.But why all our car design look so crappy. For God sake.Please hire talented designers. So many in kampung has amazing talents. “Relaxing Version, Showy Version and Enjoyable Version”! MAI is well set to ensure a competitive local automotive industry in the region. so this is the ev vehicle that they are going to use to achieve the 100k target? I want BAIK P100D Ludicrous. the interior, dull and boring much? Versions should be Panda Version , Showy Tiger and Angry Dragon . The success of this BAIC will massively depend on its pricing. It’s already dated in design, safety is very basic, and from what I can tell from the photos, the interior materials look very cheap. Even more worrying is reliability (both car and battery) and aftersales service. The BAIC brand is also unknown here, even more unknown than Great Wall/ Haval and Chery who have both been here for around a decade now. It will be hard to convince Malaysians to buy EVs and Hybrids, because our fuel prices are relatively cheap (but it should be even cheaper) compared to Europe, America and Japan where EV and Hybrid cars sell the most. So far, most of the popular Hybrid cars here have either sold on good pricing (Civic/Jazz/Insight Hybrid) or high specs (Camry 2.5, some Audis, Mercs). Only the Prius seems to sell mainly because of its excellent FC. These are ppl eat too full have nothing to do and dump these ugly car into our country without market study. How to go back from KL to Ipoh during festive season with just 200km range ? Especially traffic jam will reduce the range even further. The exterior and interior of this crappy car makes u double check whether we live in a year of 2016 or 1986. The finishing look damn cheap af. Any news of actual launch in Malaysia? Its now coming to mid June 2017. Still no news on this brand? What happen to this brand? Gone? Not approve? Yea. Its been two years already, and not a single news on this BAIC EV200.